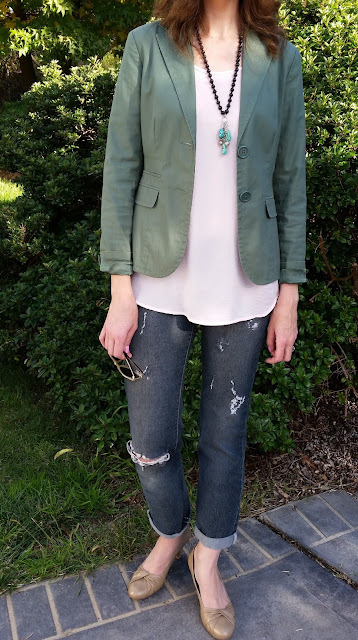 The Tall Mama: Dress It Up With A Blazer! Folding up with sleeves keeps the blazer casual. Laughing at my daughter just out of shot - not the best face! As a Mama of 2 little girls my everyday style is casual. I need to be able to run around after tiny humans! My favourite way to make my casual outfits look a bit more pulled together and dressed up is to wear a blazer. I'll usually fold the cuffs up to tie in with the casual look (also a great way to disguise sleeves that are a little too short!). From my previous corporate working life I have loads of blazers and suit jackets so rather than leave them languishing in my closet I like to take them out and about every once and a while! How do you like to dress up your casual looks? Blazers look so great with jeans and on you. I wish I could wear them. I'm only 5'3' and still waiting for my breast to deflate after sopping breastfeeding, so they can make me look stocky at the moment. 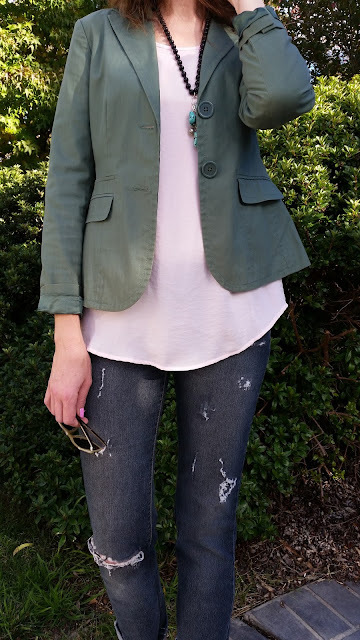 Love having a blazer to "jazz" up an everyday look! I love blazers too and this one is great with those ripped jeans. It's structured with a hint of rebel. Love it!